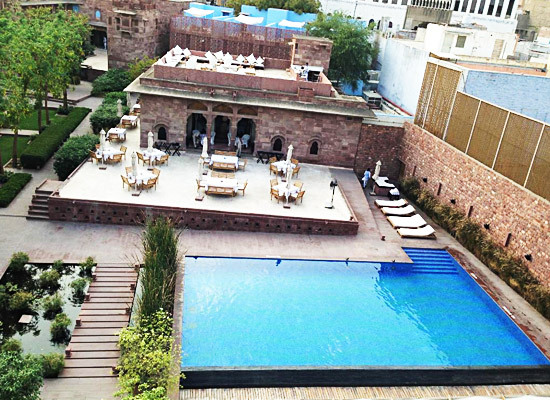 "The heritage hotel in Jodhpur, Hotel Raas, is the first boutique hotel in Jodhpur. Along with the original four buildings, three more buildings have been constructed in the hotel complex. 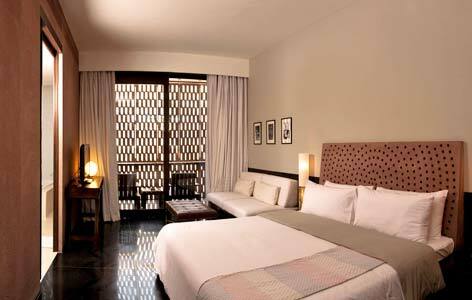 The hotel is widely known for providing the best possible views of the majestic Mehrangarh Fort. The hotel lures tourists because of the rich heritage that is reflected by it. 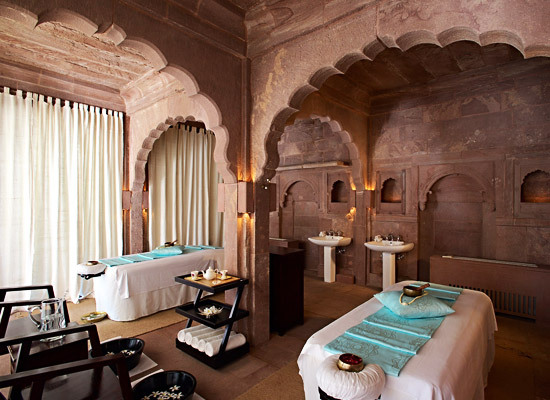 The hotel has been given the accolade of "Asia's Best Fortress" by Time Magazine in the year 2008 which truly shows the excellence of this retreat in Rajasthan. The magnificent fortress in the Walled City, surrounded by Mehrangarh's Victory Gate and Palace and a few distance away from Clock Tower, RAAS was originally built in the 18th century. The royal Fortress consisted of four attractive buildings using Jodhpur’s 'rose-red' sandstone. The first building was the trademark of superior Rajput Architecture and it existed as the private residence of the Royal family. The building that was built at the last, served as the entertainment zone for the Thakurs. Apart from these two, the building complex also consisted of Dari-Khana, the Chamber of Carpets, which was used to accommodate the Royal guests of the Thakurs, a tiny Temple and the horse Stables. Luxury Rooms: These rooms are painted using contemporary white and black designs. 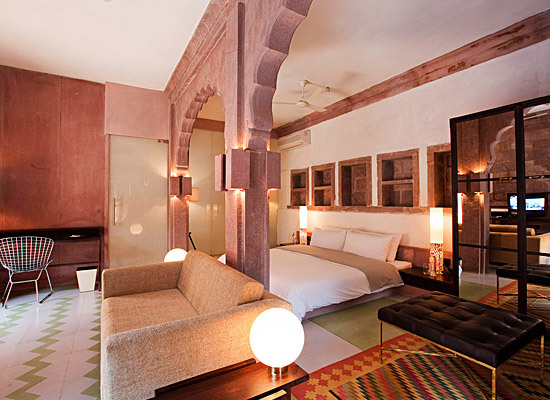 The antique Jodhpur handwork of red sandstone jhali gave an exotic feel to the rooms. Duplex Suites: These suites have are very spacious and the additional private gardens give breathtaking views of the Blue City. 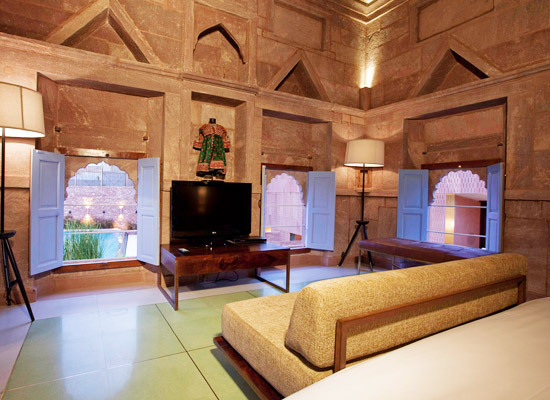 Heritage Suites:These traditional suites are located where originally, the 18th century Rajput leaders used to reside. The traditional charms of these rooms are retained and with the luxurious amenities provided to guests, a stay in these rooms is truly memorable. The heritage hotel in Rajasthan, Hotel Raas serves guests with two of the best dining restaurants in the state. Darikhana: The restaurant serves Indian dishes to tourists that are cooked from the fresh produce of vegetables and salads, herbs and spices plucked from hotel’s own organic produce. 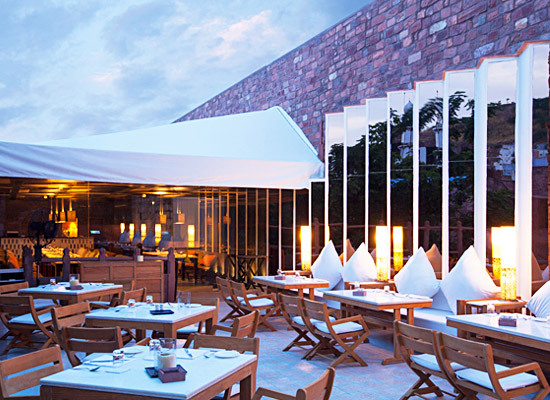 This restaurant is located on the terrace and hence tourists get to view the magnificent Mehrangarh Fort and make one dining experience truly romantic. Baradari: This international cuisines restaurant serves guests mouth-watering Mediterranean and Thai delights. The princely state of Jodhpur was established by the legendary Rajput clan leader Rao Jodha in the year 1459 A.D. The city has become one of the best destinations in the desert state of Rajasthan because of traditional Rajput heritage at every corner along with surprising modern touches. It is the only city of Rajasthan only after Jaipur that has a population of more than a million.